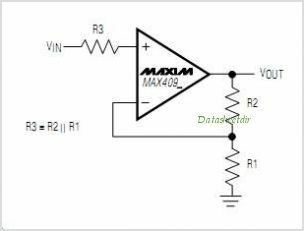 The single MAX4091 dual MAX4092 and quad MAX4094 Operational Amplifiers combine excellent DC accuracy with Rail-to-Rail operation at the input and output. Since the common-mode voltage extends from VCC to VEE, the devices CAN operate from either a single supply (2.7V to 6V) or split supplies (1.35V to 3V). Each op amp requires less than 130A of supply current. Even with this low current, the op amps are capable of driving a 1k load, and the input-referred voltage noise is only 12nV/Hz. In addition, these op amps CAN drive loads in excess of 2000pF. The precision performance of the MAX4091 MAX4092 MAX4094 combined with their wide input and output dynamic range, low-voltage, single-supply operation, and very low supply current, make them an ideal choice for battery-operated equipment, industrial, and data acquisition and control applications. In addition, the MAX4091 is available in space-saving 5-pin SOT23, 8-pin MAX, and 8-pin SO packages. The MAX4092 is available in 8-pin MAX and SO packages, and the MAX4094 is available in 14-pin TSSOP and 14-pin SO packages. This is one package pinout of MAX4091,If you need more pinouts please download MAX4091's pdf datasheet. 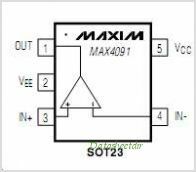 This is one application circuit of MAX4091,If you need more circuits,please download MAX4091's pdf datasheet.